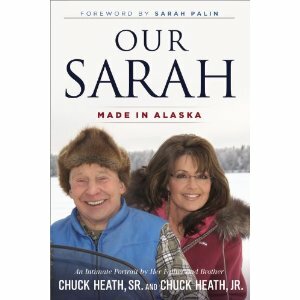 “Our Sarah, Made in Alaska” is set for release on September 25th. In the meantime, here’s a roundup of information so you don’t miss any news on a book that’s sure to be a fascinating read. Follow Chuck Heath, Jr. on Facebook here. Chuck has been posting some great pictures as well as details of the book tour. Be sure to “like” the page today. -Oct. 5 Dallas/Highland Village, TX. 7:00pm Barnes&No. We are also planning on stops in Ohio, Idaho, and Washington State. If the tour goes well, we’ll add a second leg. We’d love to get to as many of your states as possible. We’ll be on Hannity’s tv show, Sept. 24th, and Fox and Friends, the 25th. We’re also doing lots of local media across the country. America’s Sweetheart once again. Sarah Palin’s approval rating continues on an seemingly inexorable rise as she reaches new heights for the year at 53.62% approval on the day when Gallup records Mitt Romney at 44% against President Obama at 49%. Palin is up a massive 35 points points since 2010. This result follows on from PPP Polling earlier finding that Sarah Palin was more popular, by far, than any of the declared GOP candidates in the recent primary campaign, with a 68% approval rating AT THIS LINK and a net positive rating of +48. Now a poll (Graphs at bottom of this page) at Election Meter.com has her approval also at a significant level. Undertake the long struggle she has done indeed, and her tenacity seems to finally be paying, off as voters now are seeing her in a substantially positive light again.The following factors may also have been significant contributors to her continuous rise. Sarah Palin accused President Barack Obama Thursday of pursuing a “a policy of appeasement” in the Middle East and described the American-made film denigrating the Prophet Mohammed that ignited the violent attacks on U.S embassies as a “red herring” and “phantom video” the administration is using to hide its policy failures. 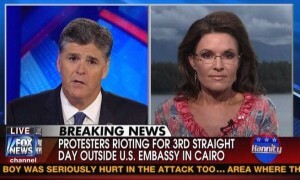 “This film, as you mentioned in your intro there, that is a red herring,” Palin told Fox News’s Sean Hannity Thursday. “And the media is going along with the Obama administration, pretending like this is a protest against some phantom video on YouTube. No. It’s because the Obama administration dropped the ball. “And they have not taken head-on this war on terror, and they have adopted a foreign policy of appeasement where our enemies no longer fear us and our friends can no longer trust us,” she added.